Wind Drift Farm in Poestenkill is now offering Monday home delivery of fresh farm products from a number of local food producers from the Capital Region. To keep the delivery efficient, service is limited to select neighborhoods in the Poestenkill, North Greenbush, East Greenbush,Averill Park and West Sand Lake and Troy areas at this time. If you are a resident of Harmony Mills or Brunswick and would like Wednesday delivery choose "The Lofts at Harmony Mills/ Brunswick delivery"
If you are coming to the farm to pick up eggs, then choose "Farm Pickup" for your order. We'll contact you to arrange a day and time for pickup. Many families have an interest in eating fresh, healthy, local farm foods, but don't have the time to connect with farmers. To help solve that problem, Wind Drift Farm owners John and Sandy Shuhart have established an ordering and delivery Food Hub through this ordering website. Customers can now access a variety of healthy food products each week from a number of Capital Region food producers with a single online order, a single payment and a single Monday or Wednesday delivery. Available food products are updated at the beginning of every week. Customers may place orders anytime between Sunday and 11AM Thursday for any products listed. All products will be sold on a first come, first served basis. There is no minimum order size and no requirement to order every week. There is a $1.95 home delivery charge, and a small order assembly charge based on the weight of the products in each order. Customers must leave out a picnic cooler so that we can drop off orders and move on. With the summer weather please place ice packs in cooler. The location where the cooler will be left is noted on each order. A final confirmation of the order will be emailed just before the order is delivered. If you think you may be interested, please click the Join Our Newsletter button on the left right now, before it's forgotten. That way, you'll be kept informed, even if you don't order right away. Our hope is that you will become our customer to enjoy the benefit of having locally produced food products delivered directly to your home. 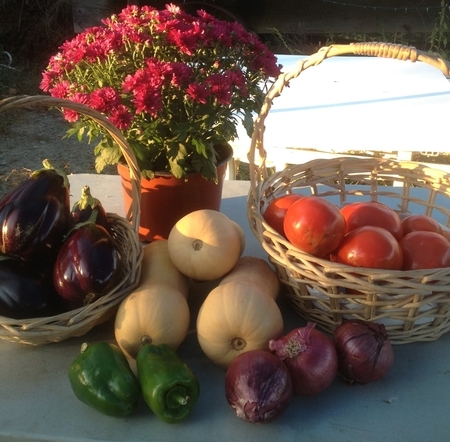 Using our Food Hub is much like going to a Farmer's Market without leaving your home. You have the opportunity to buy any products listed until the quantity runs out. The source of every food item will be displayed, so you know exactly where your food is coming from and who produced it. storage crops like apples, carrots, onions, winter squash, garlic and other vegetables. Thanks for visiting our website. We hope to see you soon!